When you think of getting a massage, having your scalp massaged isn’t the first thing you think of. Nonetheless, when you massage your scalp, your entire body relaxes almost instantly. It can help you relieve stress, banish brain fog and even reduce tension headaches. Not only that but its also great for your hair! If you’re dealing with hair loss or thinning hair, a good scalp massage stimulates your hair follicles, allowing more blood and nutrients to fuel hair growth. It can also help resolve issues like dandruff and scalp psoriasis. If you like these benefits then you may be interested in a scalp massager. A scalp massager is a manual or electric device you can use to massage your scalp so you do not have to get someone to massage your scalp for you. In this article, we’ll look at different types of scalp massagers and what you want to look for when shopping for a great one. How Do Scalp Massagers Work? 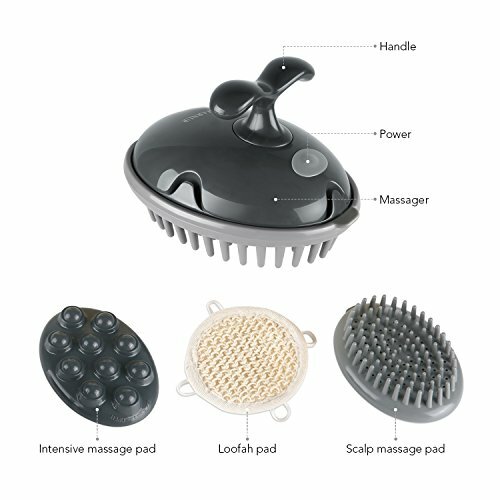 Scalp massagers come in a variety of different forms but in general, they all use effective techniques like acupressure, vibration and rolling to gently stimulate the scalp. Most of them can be used whilst sitting down and watching TV or at your desk, however, some are waterproof and can be used with massage oil or in the shower with shampoo. But the main thing about all of them is that they bring many benefits. Scalp massages have been shown in studies to increase the release of serotonin, which is a feel-good hormone that promotes a sense of well-being. They’re also shown to lower stress hormone levels, blood pressure and your heart rate . 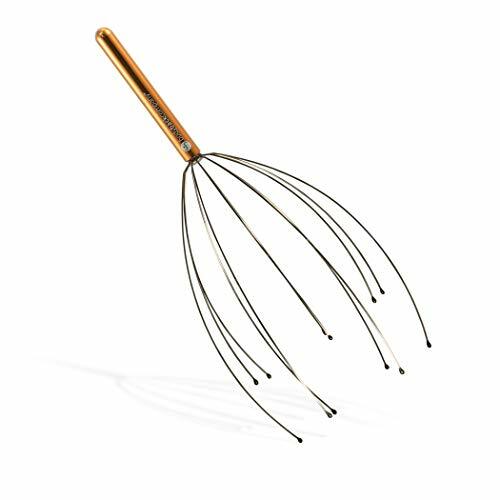 So if you’re feeling a lot of head tension at the end of a long hard day of work a scalp massager may be of great help. Not to mention it can also help with healthy looking hair! What to Look when Choosing a Scalp Massager? What separates an average scalp massager from a great one? Scalp massagers come in all different styles for different uses, so it’s important that you first identify the right one for you and the type of features that you want. Electric scalp massagers either vibrate or are programmed with automatic massages. Some offer both these features. They usually cost more than manual scalp massagers, and not all electric scalp massagers are waterproof for use in the shower. They make a bit of noise, though some are quieter than others. An electric massager with a vibration feature is able to instantly increase blood circulation with less manual effort. The “buzz” creates a soothing feeling that can’t be produced by hands or a manual massager. Manual scalp massagers come in different shapes and forms. Some are geared toward use in the shower for treating scalp issues. One style is a hat-like manual massager you move up and down to massage your entire scalp at once. If your scalp massager is miniature and only covers a small fraction of your scalp at a time, it’s harder to get the full-body relaxation effect that larger scalp massagers provide. This type of massager feels great because of the coverage it gives, but it doesn’t give you many options to mix up the feeling. A scalp massager designed for use in the shower allows you to work a hair product into your scalp more effectively in order to treat dandruff, hair loss and other scalp-related conditions. These massagers are fully waterproofed, typically made with silicone nodes and sealed with rubber, and can be electric or manual. Even if you mostly want to use your scalp massager at your office chair, in bed before you turn out the lights, or anytime you need a moment to relax, it’s nice to have a waterproof massager. Once in a while, you might want to use it while soaking in the bath, or while running a hot shower on stiff muscles. Now that we’ve had a look at the types of massagers and you know what you are looking for, here is a list of the best ones to look out for. The Heeta scalp massager is a top-rated manual massager for use in the shower. The material that massages your scalp is made of silicone, which is durable and long-lasting, and safe to use with various products like shampoos and oils. This is a great massager to use in the bath or shower for an at-home spa treatment. If your goal is to resolve dandruff or scalp psoriasis, using it to wash your hair can help you deep-clean your scalp and clear away dead skin. Its conical nodes are able to penetrate thick hair and make direct contact with your scalp. You can also use this massager any time while you’re dry, because the silicone material doesn’t stick to your hair or pull it. 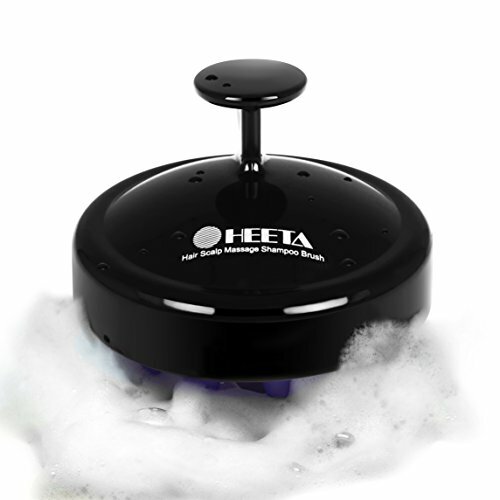 In fact, the Heeta massager is so well-rated because of its effectiveness. Unfortunately, many users complained about the hair tangling it causes so easily. 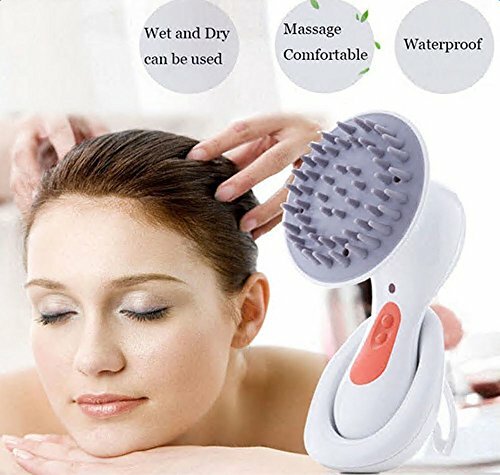 For the incredibly low price, the value this scalp massager packs is amazing. If you aren’t ready to invest in a more costly device, try this one for under $10. The Breo portable mini scalp massager is also waterproof, but it’s electric, so you can get a more intense massage with less manual work. That said, there’s a $90 price difference between the Heeta massager and the Breo. It has a sleek, aesthetic design with a charging base that makes it look like office desk decor. It’s compact for portability and easy and comfortable to grip in your hand. The conical silicone nodes on this massager are similar to those on the Heeta massager, but the automatic massage programs are able to replicate traditional massage techniques, including kneading, acupressure, rhythmic compression, longitudinal gliding, oscillating pressure and deep friction massage. Despite all this, some who made the investment found that the feeling of the product didn’t warrant a $100 purchase when a manual scalp massager is also effective. The manual scalp massager by the Body Back Company is possibly the easiest manual massager to use. 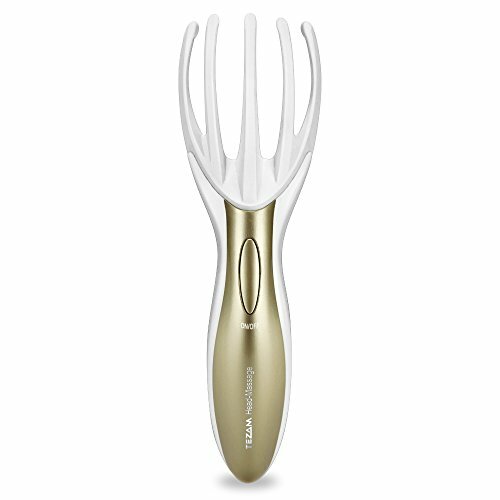 It has a long handle and it simply requires you to hold the handle and move the massager up and down so that the prongs can glide over your scalp. It’s very relaxing and effective in stimulating blood flow. While it works great, it doesn’t offer you other features many scalp massagers provide, such as different massage modes or styles. Still, it doesn’t take much money to get your hands on one of these, and its nodes don’t tangle up hair as much as conical ones can. 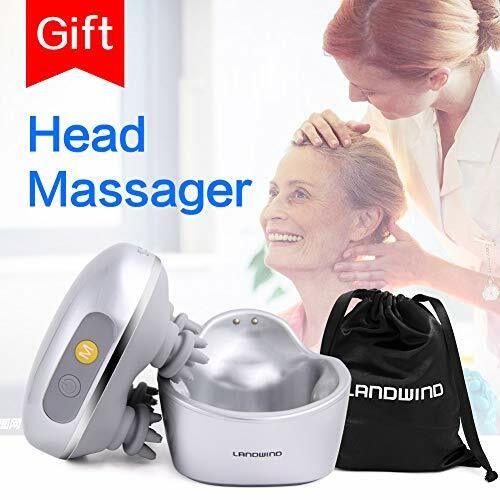 The electric head massager from LANDWIND is a vibrating device you can use for your scalp, but also for virtually any part of your body. It offers different modes and its vibration feature is great for stimulating circulation in a way manual scalp massagers can’t. However, it’s doesn’t have the pointed nodes most scalp massagers have. Also, it can sometimes catch hair. If you like foam rollers, you can almost think of this device as a tiny, vibrating foam roller. You can use roll it against the palm of your hand to massage your neck and the small muscles where your neck meets your head. If you suffer from migraines or tension headaches, the LANDWIND massager can help break up the tension causing it. The soles of your feet and your calf muscles are other good places to use it. While the LANDWIND head massager is more expensive than a manual scalp massager, it has a 30-day money-back guarantee, so you can at least try it out and see if it works for you. The electric scalp massager from MARNUR gives you more features in one product and for a better price. It has 3 different attachments to the main base you can switch out, including 2 different massage pads and a loofa. One of the massage pads has rounded nodes that vibrate to massage your scalp. However, you can also use it on muscles throughout your body. Its other massage pad has conical nodes for massaging your scalp and reaching the hair follicles. The battery compartment is sealed with rubber and can be used safely in the shower. The vibration feature can help you massage shampoo or hair growth products into your scalp so you can better resolve issues like dandruff and hair loss. Then, you can use the loofa attachment to cleanse your body, with the vibration feature allowing you to penetrate your skin more effectively. While the MARNUR is less expensive than most electric scalp massagers, its only automatic massage feature is vibration. 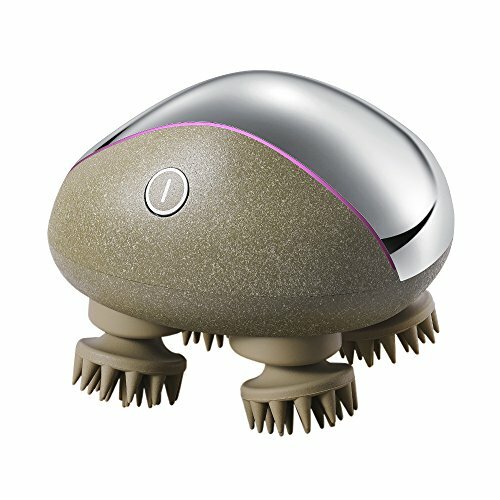 If you’re looking for an electric massager because you want more technique to go into your scalp massages, this one may not fit the bill. 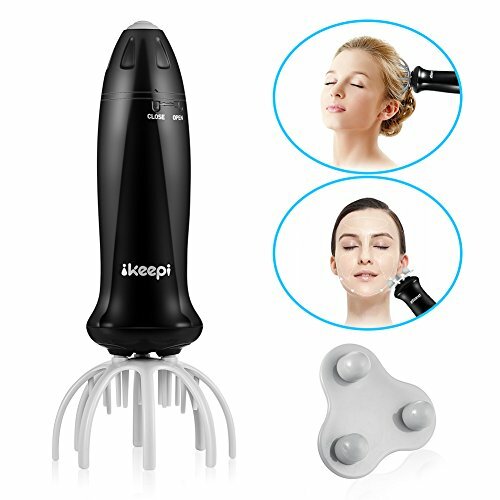 The KESITIS electric scalp massager is a top-rated device with features similar to the Breo, but it’s half its price and massages a larger surface area. By massaging more of your scalp at a time, the KESITIS can better induce full-body relaxation. You can also use it to massage your shoulders, the soles of your feet and any other part of your body. What makes the KESITIS really stand out is that it has 84 nodes that rotate clockwise and counterclockwise to stimulate the scalp. That’s quite a bit more than you get from many scalp massagers, not to mention a set of masseuse’s hands. It’s waterproof, so you can even enjoy this amazing massage in the shower or bath. While many scalp massagers have soft silicone nodes, the nodes on the KESITIS massager are harder, and for some users, they feel a bit too hard. Some users have reported hair catching, pulling and tangling with the KESITIS, while others have said it doesn’t at all, so it may depend on your hair type as to whether it works for you. The Tezam head and neck massager is an electric device that combines vibration with massage for an intense experience. With 5 prongs, it’s able to push, pinch, rub and knead your scalp while producing 8,500 micro-vibrations per minute. You can use it on your neck, as well as your arms, legs or back, to relieve tension. The prongs don’t move, so although it’s an electric device, you still need to work the massager in order to achieve the feeling you’re going for. The Tezam massager is battery operated, but instead of recharging it, you need to replace its batteries. The downside to this is that its vibration intensity weakens as the battery loses its charge over time. The grip of the device vibrates more than the actual prongs that touch your scalp, which may bother you. Unfortunately, it’s not waterproof, so you can’t use this scalp massager in the shower. The iKeepi massager has 2 interchangeable massage heads for different types of massage that target different areas. Unlike most scalp massagers, this one’s designed to also massage your face and relieve tension around your eyes. The scalp massage head has 8 prongs you can use to stroke your scalp as the massage head vibrates. The other massage head has 3 round nodes designed to gently melt away facial tension. The downside to this device is that it’s powered by AAA batteries, which aren’t able to produce a very powerful vibration. You have to replace the batteries quickly if you use the product frequently. Nonetheless, the design of the massage heads is what makes it effective in relaxing muscles and stimulating the scalp. You can’t use this in the shower, but it’s easy to travel with and pull out of a bag whenever you need a moment to relax. 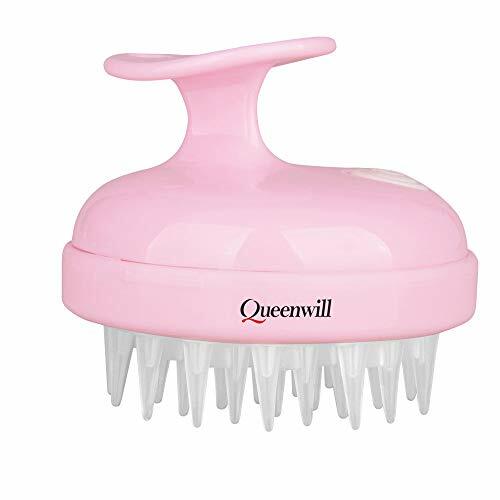 Similar to the Heeta scalp massager, the Queenwill is a waterproof device with silicone conical nodes designed to penetrate through hair and reach your scalp whether you’re in the shower or dry. The difference is that the Queenwill massager is battery-powered and provides vibration to further stimulate your scalp, increase circulation and relieve tension. It takes an AA battery, which means, like the iKeepi scalp massager, its vibration loses intensity as the battery loses its charge. Instead of just vibrating, however, it has 2 modes for vibration, including regular vibration and pulses. The points of the nodes are too hard and painful for many first-time users, but you can adjust to it with time. The Scenstar scalp massager vibrates at 7 different frequencies, and you don’t have to worry about it losing intensity as the batteries die, because it has a rechargeable base you can place it in after each use. It also comes with a USB port cable you can use to charge it on the go. In fact, you can even use a universal smartphone charger to charge it. The Scenstar device is waterproof for wet or dry use. Thankfully, its conical nodes are gentle on the scalp and don’t catch or pull your hair. 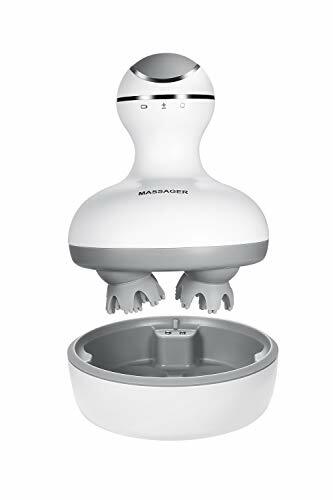 The main complaint some users have with this massager is that in spite the fact that you can choose from so many different settings, the conical nodes are made of rubber and feel too soft for people who want a more intense massage. The Scenstar massager is designed specifically for comfortable use on the scalp, and the rubber nodes likely aren’t strong enough for use on your shoulders and other areas. The best scalp massager in this line up has to be the waterproof electric massager from KESITIS. Its 4 massage heads with 84 total nodes provide a very satisfying massage while taking good care of your skin. Compared to other electric massagers, it covers a wider area of your head so that you can experience more relaxation. It works well on your neck and shoulders, and because there’s so much massage action it provides, you don’t have to put in much effort. It’s easy to charge and runs for 90 minutes before it needs to be recharged. It has a strong vibration with different speeds, and it’s comfortable to grip. If a manual massager is what you’re going for, the Body Back scalp massager is the way to go. It instantly induces relaxation while directly stimulating your scalp and hair follicles. When it comes to a great scalp massager, the one that gives you the best feeling is probably the one that provides the most benefit. A good scalp massage is proven to reduce stress, which you’ll be able to notice instantly with a good product.